Here's where you start learning to cook! Step by step, you are going to learn what you need to know to cook for yourself and others. But even if you are already an experienced cook, you might still want to browse through the beginning pages. You could learn something that makes you a better cook! We start simple, and progress in easy steps. Before you know it, you will feel comfortable in the kitchen, willing to try new recipes, and even to modify them to your taste. Some of the lessons are very detailed, and you more experienced cooks might think I’m overdoing it. But remember how it was when you first learned, and realize that I’m helping novices learn from scratch. You can speed-read or skip over the stuff that you already know. With each lesson, I'll tell you what you need to have on hand, what you are going to learn, how long it will take, how to do it, and what results you should expect. Plus, each lesson will result in one or more simple recipes so you can immediately use what you have learned. 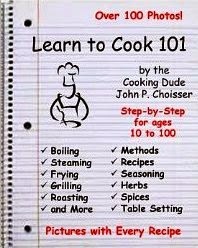 You are also going to learn to cook without being hogtied to recipes. You will be able to look in the fridge or pantry and figure out what you can make with what you have on hand. For example, breakfast is a great time for me to use up leftovers. And I get the best breakfasts in town, right on the spur of the moment. And without any recipes, just learning to use the basic skills you'll learn here. But it is also important to know that sometimes recipes need to be followed exactly. Especially when baking, ¼ of a teaspoon is specified for a very good reason. I’ll try to make you generally aware of when it’s ok to wing it and when it’s not. We're going to start learning to boil water, and to make something useful from it we'll boil some eggs; soft boiled, hard boiled, and even coddled. Then use those eggs for egg salad, deviled eggs, and the Original Caesar Salad, using Caesar’s own recipe as told by his widow. Then we'll learn how to make tuna salad, learn to cook pasta, and how to use the oven for baking and roasting. We'll cover frying, poaching, boiling, baking, barbequing, grilling, roasting, and sautéing. You'll make cheeseburgers, French fries, macaroni and cheese, salads, and other "fast food". You'll also learn to make Mexican, Italian, and other ethnic dishes, and special dinners for dates and company, like prime rib or poached salmon with orange tarragon sauce. While I'm at it, I'm going to cover some other topics you might have missed in your earlier days: how to set the table, how to carve a turkey, how to chop up an onion, cutting up chickens, how to plan a meal, defrosting stuff, and so forth. Which napkin is yours? What the heck, you want to feel comfortable when the boss or a date takes you out to a fancy restaurant, don't you? Before you put some bread on a bread plate, you better know which plate is for you! The last part of the book is for reference. There you can find help if you’re facing an empty kitchen that’s a strange land to you. How to outfit the kitchen with pots and pans, spices and herbs, kitchen tools, and other things you’ll need to get started, like how to start with an empty pantry or fridge. There are also some helpful tips, such as disaster recovery (how to correct some kitchen mistakes), kitchen safety, and weights and measures. The sections on seasoning, herbs, and spices will be of interest to nearly all cooks, regardless of their experience. I’ve added links back to the Table of Contents throughout the book to make it easy for you to jump around in the book as you use it. I realize that most eBook readers allow this already, but this way this feature is always available. The important thing is to have fun and don’t obsess over perfection. After a few lessons, you’ll be able to cut down on take-out food, eat better, and save money!